The dream of all RC farm and construction vehicle enthusiasts is surely to own an RC excavator, there is nothing more satisfying than to be able to load a trailer on your diorama with your RC construction equipment. RC excavators are probably the most complex conversion to attempt because they have a lot ofÂ moving parts and the hardest part is raising the diecast boom which is usually very heavy even with an empty bucket. My first RC excavator was a Hitachi Zaxis 210 made by ROS, I tried to use servos to control it and quickly learned how difficult an RC excavator build is. 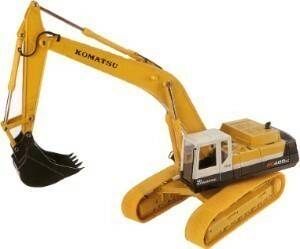 My second excavator is a Komatsu PC400LC made by Joal, this time I used N20 gear motors to drive screw mechanisms. The third excavator IÂ convertedÂ was a plastic Revell kit of aÂ Liebherr A900C Litronic, the lighter plastic body makes this an easier conversion.